When Newark Mayor Cory Booker used some Jersey elbow grease to appoint an ally to a vacancy on the City Council last month, a near-riot erupted in City Hall. As a mob stormed the dais, Booker’s council candidate was knocked over and a reporter was hit with wayward police pepper spray. The incident may have lacked the gore and shirt-ripping of the Ukrainian parliament, but it was nonetheless unfathomable for any of New Jersey’s 565 other municipalities. At the following meeting, Booker faced taunts of “Shame on you!” from two council members—both former running mates, no less. Following the vote, Booker walked out, his lips tight and phone in hand, as boos rained down on him from the rafters. So how does he respond to open rebellion from the legislative body of his city while maintaining a nearly mythic reputation up and down the Jersey Turnpike and across the country? By generating new content, that's how. The morning after the near-riot, Booker took to Twitter. He didn’t mention the brawl, the council meeting, or his long-term political future. But he did declare his “participation” in the SNAP Challenge, in which he would try to live on the budget of a food stamp recipient for one week. He noted that he would post videos of his experiment on the social media site he co-founded, WayWire. Not only that, but Booker would take Instagram photos of his food and blog nightly ruminations on LinkedIn, of all places, while also serving a steady diet of tweets and Facebook status updates. This pisses off some Newarkers to no end. Booker, born and raised in the suburbs, educated at Stanford and Yale and Oxford, has always been seen as an outsider by the old political guard in New Jersey’s largest city. That perception originated with his first mayoral run, which was immortalized in a Oscar-nominated documentary, “Street Fight.” And it’s been exacerbated, his enemies say, over his six years as mayor, with countless trips out of town (actually, the Star-Ledger counted them: 119 days in 18 months), paid speeches ($260,000 in 2011, the paper estimated), famous pals (Oprah Winfrey, Steven Spielberg, Bill Gates) and the moneymen who show up on his campaign-finance reports (they live in the 'burbs—and work on Wall Street). 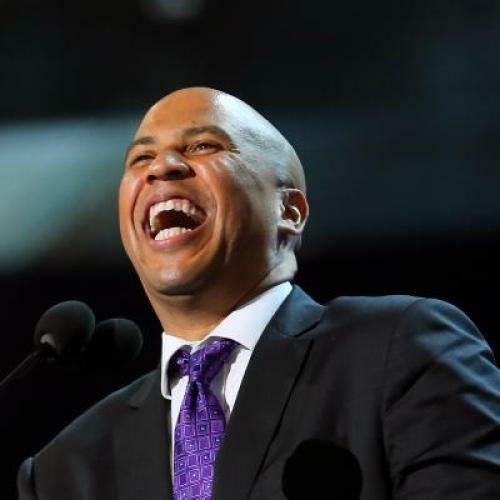 Booker’s ability to reach out beyond Newark has yielded visible successes: Philanthropic money wooed by the power of his personality has brought in several hundred million dollars, funding parks, a prisoner re-entry program, veterans housing, and even bulletproof vests for cops. Booker sat next to Mark Zuckerberg at a buffet dinner at the annual Allen & Co. confab in Idaho in 2010—and just like that, the Facebook founder provided a $100 million in matching funds for Newark. Booker, observers say, has never gotten a fair shake from the old political establishment. James and his father, now back at council meetings as a gadfly, are part of the hard-core Booker opposition, says Andra Gillespie, a political science professor at Emory University who wrote “The New Black Politician,” a book about Newark and Booker. “It’s the kind of thing [where] if Cory says the sky is blue, they’d say, ‘No it’s not. It’s yellow with magenta polka dots,’” she said. During the 2002 mayoral campaign, Sharpe James famously accused Booker, a Baptist, of being Jewish, and ever since, a la President Obama, Booker has had trouble shaking this sense that he is something other. Gillespie cites taunts about Booker’s blackness and sexuality—or both, like the rumor that (gasp!) he had a white boyfriend. His green eyes? He’s white. His single status? He’s gay. The eight years he spent living in the Newark projects? He really lived elsewhere. John Sharpe James disputes the notion that there’s an entrenched opposition against everything Booker does. “He’s had time to prove himself to redefine himself—not as an outsider, as a Newarker, and that just hasn’t happened,” he argues. Booker rejects the idea that he’s in any sort of political trouble in the city. Staffers say he’s still mobbed—with adoration, that is—on the streets, and that internal poll numbers show his citywide support north of 60 percent. Bookers also contends that his opponents have only really blocked him on one big issue in six years: The creation of a Municipal Utilities Authority to handle the water supply, which has dogged previous mayors, too. Voters may ultimately decide whether the political strife in Newark reflects poorly on Booker’s leadership abilities or whether it indicates a continued determination to combat corrupted provincialism. After all, it was Christie who, as U.S. attorney, indicted former Mayor James and rode an anti-corruption, anti-establishment message to the governor’s mansion. He did it, however, with a scowl and straight talk. Can Booker do it with a smile and a tweet? Matt Katz covers Christie for The Philadelphia Inquirer. Correction: A previous version of this article misstated the award for which "Street Fight" was nominated.